What does it mean to be the husband to a Proverbs 31 wife? Adam changed his definition of who he was when Eve came on the scene. Adam changed because there was a ‘helper’ created from him and given to him. He changed to become worthy of a mate, a life partner, a wife. We as men, must change our definition of who we are to become worthy of a Proverbs 31 wife. We must change our perspective and realize that in our natural state of being, we are not worthy of that which is valued more precious than anything on earth. We must “rise up and bless her and praise her” as it says in verse 28. We must conform ourselves to be worthy of that ideal which God has brought to us, as He brought Eve to Adam. We must alter our thinking, our very being, in order to be deserving of such a love as this. Then the Lord began to teach me. He showed me that we do this not being the macho man who usurps her wisdom but by listening to her wisdom, by being sensitive to her needs, her wants and her desires – showing every consideration to her needs as she is sensitive to ours by her very nature - just as Christ is sensitive to the needs of His bride, the church. And He showed me what the husband to a Proverbs 31 wife looks like in Ephesians 5. There are four characteristics or principles of what a husband is to be and how he is to love his wife. constant. As the head (covering) over the woman, the Ephesians 5 husband must give up everything he has in order to make sure his wife has what she needs - No matter how big the sacrifice! For the Ephesians 5 husband, meeting his wife’s needs isn’t just one of his priorities – it IS his priority. The Lord showed me that this pattern of love must be established early on in a relationship, not after marriage. By then it’s way too late. When we are courting is when these love roles have to be established. Love is more than that euphoric, tingly feeling that makes you do those incredibly loving and romantic things early on, that’s the easy part, it is a commitment that lasts long after the butterflies fade away and years into the relationship - until death do you part. Love is all encompassing because it is comprised of protecting your wife, honoring and respecting her, being faithful to her in every sense of the word, seeing the best in her and loving her like Jesus loves us—unconditionally. These words are spoken literally of marriage but they have also a hidden sense of responsibility and sacrifice in them, relating to the union between Christ and his church. All the duties of marriage are included in unity and love and husbands (and wives) must learn their duties to each other. Ephesians 5:25 Husbands are to follow the example of Christ in the way they love their wives. The love of Christ was extended to us before we requested it or changed our actions. Romans 5:8 says, "But God demonstrates His own love toward us, in that while we were yet sinners, Christ died for us." Therefore, men should love their wives independently of whether they deserve it or not. Marriage is not a quid pro quo arrangement guys – a husband’s love for his wife is NOT contingent on how much love she shows him! Husbands must sacrifice in order to earn the love of their wives! The husband's duty to the wife must correspond to Christ's love for the Church. This kind of love analogy creates a natural balance – the wife’s role and character reflects the spirit of Christ-like love demonstrated on the part of the husband – not the reverse. It is the husband’s responsibility as the head of his wife to create balance and security. Just as Christ doesn’t merely desire good for the church, He but loves her with everything He is. Her image is stamped on his heart and her name is written on the palms of His hands. He yearns to have her for his companion, anticipating her affections in return. And he sacrifices himself for her, demonstrating that her happiness and welfare are dearer to him than his own. Self-sacrifice is the truest test of real love. In Hebrews 13:5, the Lord promised us that He would never leave us or forsake us. The Lord showed me that a wife craves the security of knowing that her husband is committed to her "till death" Failure on the part of the husband to impart this sense of security creates a breeding ground for spirits of fear, doubt, jealousy and various kinds of imaginations that Satan uses to destroy marriages. The Lord showed me that it is the responsibility of the husband that the wife has absolutely zero doubt in her mind that he is completely and permanently devoted to her in love. So, husbands, love your wives with the zeal of delight and pleasure in them; in showing respect and honor to them; in securing their contentment, satisfaction, and pleasure. 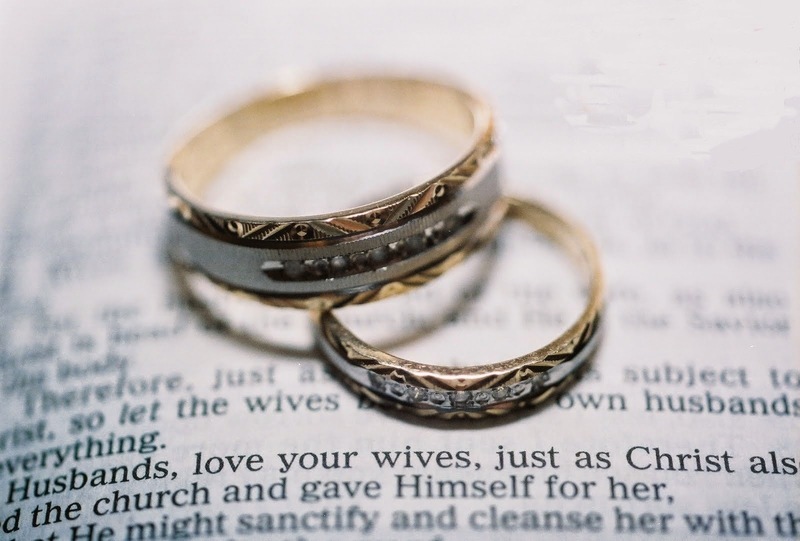 There are many other lessons to be learned from our Lord about the way husbands should love. Jesus loved us with the greatest sacrifice possible. He died in our place. If men would love their wives as Christ has loved the church, most marriage problems would not even exist! To be sanctified and cleansed with the word is to have the word spoken over you. The Godly husband speaks The Word over his wife every day and in all situations. If a situation arises, the man as the spiritual head (1 Corinthians 11:3), needs to know the Word and speak it over his wife in love. The Godly mad prays blessings over his wife every day. This is how we show her that we love her men. Helping her character remain clean is important, and the best way to do this is by taking the load off her and put it square on your shoulders. Here’s the chance to prove your machismo men! When your wife is facing a challenge, it becomes your challenge! When she has a problem, you supply the solution! Do things for her, bear her load! Take the weight off her! Husbands should protect their wives by sharing their pain and caring for them. That is the way Jesus treated us and He set the ultimate example of how we are to treat our wives. So, husbands love your wife through protecting her from all abuses; concealing her faults, and covering her infirmities through prayer and intercession. Love your wife by promoting her spiritual welfare in prayer time together. This love is single-minded, constant and perpetual. This love is demonstrated privately and publicly through acts of kindness that reflects God’s covenant with His church. This is the highest promise that you will ever enter into in a natural setting. Honor it by honoring her with lovingkindness. Holiness is glory internalized and Glory is holiness shining outwardly. Have you ever wondered why Moses’ face shown with the Glory of the Lord – because he was saturated internally with the Holiness of God! He was so anointed that he couldn’t help but glow with God's Glory! God calls husbands to see their wives in this same way - as Holy - not having a spot or wrinkle. God calls husbands to look at their wives and love all that they see as Holy - glowing. God calls husbands to encourage their wives - to embrace who their wife is and love every part of her. The Lord showed me that the reason for this - and this is the key to this whole thing - is that the more you shower your wife with this kind of love, the more your wife will fulfill her role as the Proverbs 31 woman! She becomes the Proverbs 31 woman, a model wife! And you become a better husband by loving her in all she does. That’s Holiness! The Lord explained that our charge as husbands is to do all we can to reveal the true beauty, the Holiness, inside her so that she may shine in Glory! Just as Christ knows that the church has some issues He doesn’t see her as messed up. You see, we may see the current Church containing a mix of clean and unclean together, kind of like Noah's ark - or like the wedding banquet hall, in Matthew 22, that had some guests dressed in fine wedding clothes all ready for the festivities and some that weren’t quite put together - or like the fishermen who can’t see what kind of fish are caught in the nets underneath the waves, so he takes in both good and bad fish because he can’t discern the bad from the good. And yet, the Church is termed "Holy". You see, the church is Holy to her ideal and ultimate state of being as Christ sees her. When the Bridegroom comes, the bride shall be presented to Him wholly and without blemish. Christ sees the church as His lovely bride; pure and spotless, a radiant beauty, shining in Glory. Jesus is blind to any imperfections in His bride because He loves her without borders. So must we, as husbands, see and reveal our wives beauty by wearing The Robe of Righteousness anointed with Unmerited Favor and grace that God imparts to us so that we can love her without limit, without boundaries - a true endless love. Verse 31 here states this quite well when it says “For this reason a man shall leave his father and mother and shall be joined to his wife, and the two shall become one flesh.” This verse is actually an echo from Genesis 2:24 and is repeated in Matthew 19:5 and Mark 10:7. The Lord showed me that just as the church is part of Him, the wife is the husband’s very self; he can no more fail to love her than to love himself, and indeed loves her more than himself in the sacrificial way that Christ loves the church. In this sense husband and wife are considered two souls in one body just as Eve was flesh of Adam’s flesh, and bone of his bone, the two are one flesh – like Holiness is to Glory and Glory is to Holiness. All this being said this is not an easy task for men – but growth is painful. By nature we are alpha – head strong and stubborn. By nature we think that the Proverbs 31 woman is a gift from God – that she must conform to us – when in actuality, IF we want to be worthy of this kind of love, we must conform ourselves to her and give of ourselves without limitations – we must earn her love. It is only by loving a wife in this manner that she will be fulfilled and in turn will fulfill your needs as the Proverbs 31 wife. Do you see why it is important to be equally yoked? It can be difficult enough for a Christian man to get over himself, his 'manly' pride to sacrifice himself in order to love you the way that God intended. An unsaved man, who is totally ignorant of these Godly principles wouldn’t even know where to begin to love you in the way that God intended him to – the way that you deserve to be loved according to God’s plan. The truth is that the vast majority of Christian men don’t have an understanding of this concept. I hope this teaching has shed some light on how you, as women, approach dating, courtship and marriage from a Godly perspective. We must instruct both our sons and our daughters what the Proverbs 31 wife looks like. We must teach our daughters what they should be striving to become in a Godly woman. And must teach our sons what they must be striving to earn by demonstrating their love for the Proverbs 31 wife. By him earning your love, you will define him as a real man of God and he will truly be the man of your dreams. All through these downloads that I received this week, a scene from the end of “Saving Private Ryan” kept flashing in my mind - Funny how God will illustrate things to you in ways that you can relate. You know the scene, when Tom Hanks lays dying on the bridge and he whispers to the young private Ryan two words so powerful, two words that sum up his giving his life and the lives of his men to save him. These same two words sum up this entire message: He tells him to “Earn this – earn it”. And Private Ryan lives his entire life trying to live up to those two words. As men we must earn the privilege of having a Proverbs 31 wife and we do this by following the example that Christ set in loving His bride, the church. The first line of Proverbs 31 — “a virtuous woman who can find?”—is best translated, “a woman of valor who can find?” The Hebrew is eshet chayil, “woman of valor”. Women of valor in the Bible include Ruth, Sarah, Deborah, Esther, Mary Magdalene, Mary of Bethany, Mary of Nazareth, Martha, Priscilla, Phoebe, and Tabitha. The male equivalent is gibbor chayil, or “man of valor.” Did you know that Valor isn’t about what you do, but about how you do it…and a man of valor has to earn that title! Just as we must earn a medal of valor, we must earn the Proverbs 31 woman in our life! Amen.